Inspired by the weightlessness “of laundry billowing in Mediterranean balconies”. 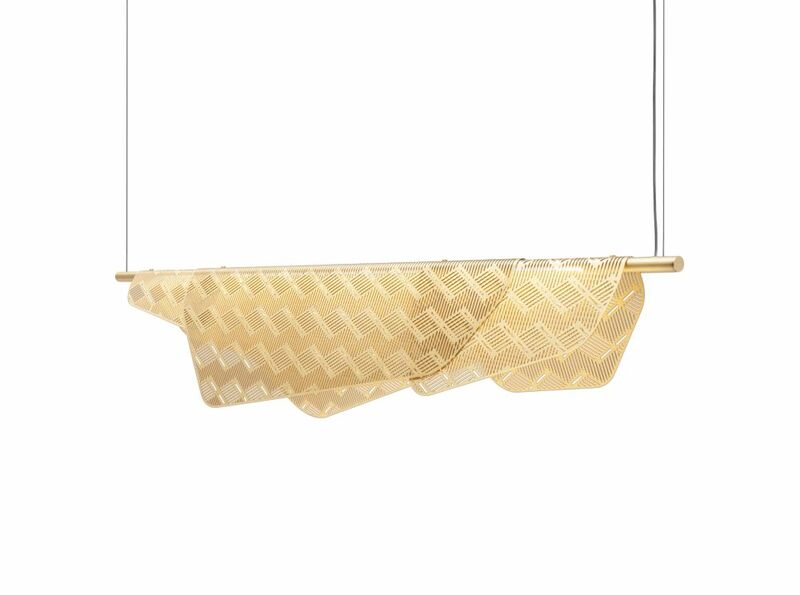 Noé Duchaufour-Lawrance designs Méditerranéa, a series of lights in brushed brass and LED. Resting on a light structure, the cloth of metal sculpts and diffuses the light through the lively and geometric pattern. This symbolism is also applied to suspension, wall, reading and standard lamps. Born in 1974 in France, Noé Duchaufour- Lawrance followed a course in Sculpture on Metal (at the Ecole Nationale Supérieure des Arts Appliqués et des Métiers d’Art) before studying design at the Arts Décoratifs in Paris. He has progressively asserted his aesthetics, first with the design of the Sketch restaurant in London in 2002, and since, through his studio which was established in 2003. 2007 was a key year for Noé when he was nominated by Maison & Objet as «Designer of the Year». He collaborates with many editors/ producers such as Ceccotti Collezioni, Zanotta, Cinna, Baccarat... and also understands how to serve prestigious brands such as Paco Rabanne, YSL Beauté, Air France through his design.